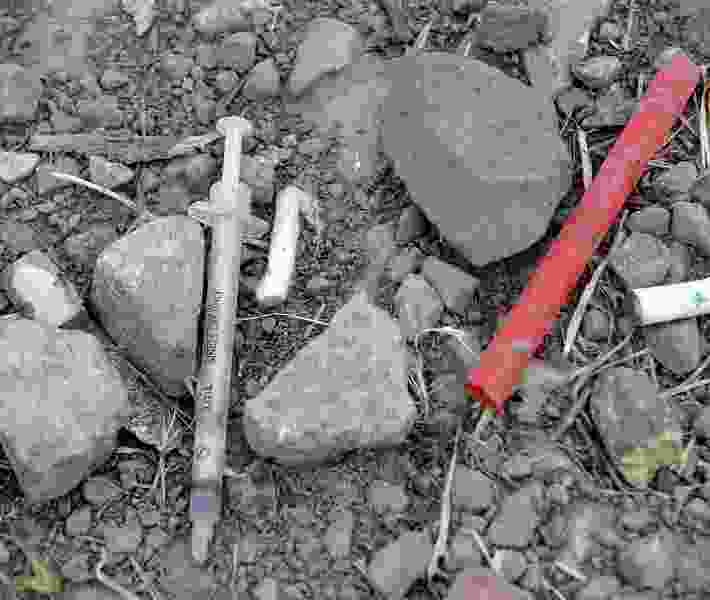 Al Hartmann | The Salt Lake Tribune Heroin paraphernalia lie on the ground in downtown Salt Lake City's Rio Grande neighborhood in July. Bowing under the weight of Utah opioid deaths, Salt Lake County officials on Monday announced plans to sue the pharmaceutical industry over the havoc the drugs have wreaked on people and public services. The lawsuit would seek financial damages — possibly tens of millions of dollars — sufficient to repay the county for criminal justice, drug treatment and social service costs incurred by addressing the widespread damage that comes with opioid addiction. The systems are overwhelmed, Salt Lake County Mayor Ben McAdams said, and the toll on families is heartbreaking. On average, 24 Utahns died from prescription opioid overdose in each month of 2015, data from the Utah Department of Health show. Such death tallies have risen since 2002, the agency says, and opioids are responsible for more drug deaths than from drugs in all other categories. From 2013 to 2015 — according to the federal Centers for Disease Control and Prevention — those numbers left Utah ranked seventh nationally for overdose deaths. CDC data show that 91 Americans die every day from opioid overdoses. Salt Lake County residents Dennis and Celeste Cecchini stood alongside McAdams and cheered the effort to go after pharmaceutical companies, who knew about the risks of their drugs, the mayor said, but failed to protect the public. That includes the couple’s son Tennyson Cecchini, who died at age 33 from a drug overdose on the floor of a bathroom in his parents’ home four days after leaving rehab. Tennyson Cecchini, his father said, began taking painkillers for an injury to his shoulder while playing hockey and could never break free from the drugs. With its decision to sue, Salt Lake County will join communities across the country that have brought more than 100 civil lawsuits against drug companies since 2015. In most cases, the lawsuits seek monetary damages for their costs, according to a story published Monday on governing.com. Some seek to force drug companies to change what are described as deceptive marketing practices that do not inform medical practitioners and consumers about the likelihood of addiction associated with opioid use. Others say drug companies committed Medicaid fraud by forcing taxpayers to cover the costs of unnecessary drug prescription. The county is considering those approaches, Salt Lake County District Attorney Sim Gill said. No decision has yet been made about whether the county will sue a specific company, such as Endo or Johnson & Johnson, he said. A private law firm will be hired to handle the lawsuit within the next few weeks, Gill said. Gill also compared the actions of drug companies to those of illegal-drug traffickers. Utah House Speaker Greg Hughes was at Monday’s news conference, expressing his support for the county’s planned lawsuit. Hughes said the county’s effort adds another prong to the state’s multilayered approach to addressing chronic homeless, crime and drug abuse through Operation Rio Grande in downtown Salt Lake City. State lawmakers have marched bills through the Legislatures in recent years, Hughes said, but Utah still struggles to make progress and save lives. “There has to be a sobering moment, and I don’t know that that’s happened yet,” Hughes said, before offering his hope for similar efforts statewide. “I’d like to see this with other counties and the state.